Sort View is one of the two main ways you can view and edit your design. Unlike Layout View that presents your design in a detailed page by page format, Sort presents an overview of your entire project as a list of icons on one screen. In Sort View you can easily group and reorder photos, insert and delete page breaks, set relative sizes, and make changes to multiple photos or pages at once. Sort View is a great place to start if you are working on a family history book and you want to quickly sequence your photos by date by moving them up and down the list, or if you want to add customised captions to all of the photos in your book. It's a faster way to make edits to large groups of photos in your project. Below is a summary of the many features and functionality available in Sort View. Click on any link to view the details. To apply any of the functions listed above, you must first select the photo or group of photos to add, edit or adjust. Just as in Layout View, photos or any other content can be added to your project by dragging them from the Content Panels to the Work Area. The photo or photos will be automatically inserted at the point you have dragged them on to the list. You can easily reorder the sequence of the list at any time. You can always tell if you have selected a photo properly as the photo and its related information will be highlighted in blue. Note : This process will not delete the photo from your computer, it will only remove the photo from your view. A Page Break indicates where one page ends and another page starts. In Sort View, Page Breaks are represented by a blue page icon in the left margin. The image below includes the number 2 above the blue page icon, indicating that it is Page 2 of the photobook. Likewise, Page 3 of the book appears below the page break with a number 3 in the left margin. Click on the icon at the top of Sort View. You will be asked how many photos you would like to place on each page. Type in a number and click the OK button. Select the photo you wish to rotate. The photo and all its supporting information will be highlighted in blue. Note: It is easy to rotate all the photos in your project at once - or even a selection of photos - by using the same technique but rather than clicking the icon at the end of each individual row, click on the Rotate 90° icons in the grey bar at the top of the Work Area. Another benefit of Sort View is that you can quickly set the size of photos relative to others by using the S, M, L and Background icons on the far right of each row. Depending on the size you choose for each photo, some photos will appear smaller or larger on the page when you move through to Layout View. You can easily edit and adjust the sizing in Layout View. Note: It is easy to resize all the photos in your project at once - or even a selection of photos - by using the same technique but rather than clicking the icon at the end of each individual row, click on the S, M or L icons in the grey bar at the top of the Work Area. Select the photo you wish to use for the page background. Note: You can also set the first photo of every page to be the background, by clicking on the background icon at the very top of the screen. A caption is a short text description that accompanies a photo to provide context or details about the photo, just as you see in the newspaper i.e. "The Prime Minister greets the crowd with a wave" or "Greg's Birthday Party, 2005" or "Sunrise over the Indian Ocean". 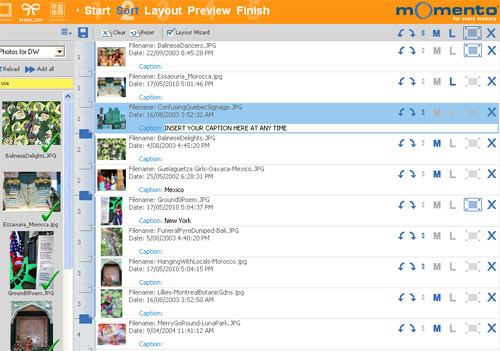 In the Momento software you can manually or automatically add captions to all or individual photos. Once you have made all your sequencing, rotation, sizing and page break selections in Sort View, you can move through to Layout View to see your designs page by page and make any edits or adjustments you like by clicking on the Layout tab at the top of the screen. Likewise, you can also easily jump back to Sort View at any stage of your design by clicking on the Sort tab. 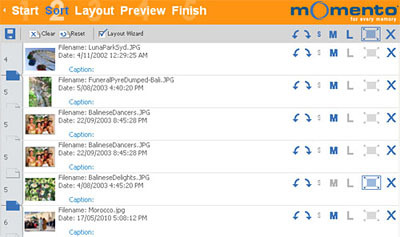 When moving from Sort View to Layout View you must choose a layout option in the Layout Wizard. The Layout Wizard will appear and ask whether it should create new layouts for changed pages only, for all pages or no pages. Your choice will define how the software automatically lays out your pages as you move through to Layout View. This is the process that occurs when the Layout Wizard check box in Sort View is checked. If you do not want Momento to automatically layout your pages with the changes you have made in Sort View, un-tick the Layout Wizard check box at the top of the Sort View screen. You will find that any photos or captions you added are sitting in the top left of the page, stacked one on top of the other, rather than appearing in a good-looking layout. You can simply position the content yourself.